Classic Hostess, online at ClassicHostess.com, is your destination for your entertaining needs. Classic Hostess sells dinnerware, including chargers, salad plates, dinner plates, and bread and butter plates, as well as drink dispensers, barware sets, cake stands, decanters, pitchers, and flatware. Classic Hostess also carries jewelry boxes, figurines, clocks, desk accessories, flameless candles, photo albums, picture frames, perfume bottles, canisters, jars, and baskets. RetailSteal.com has the best Classic Hostess coupon codes, Classic Hostess discounts, Classic Hostess coupons, and Classic Hostess promo codes. Shipping and handling rates at Classic Hostess depend on the pricing of your purchase and your shipping destination. See website for full details, exclusions may apply. Save 10% on purchases over $39 at Classic Hostess. Click link to shop and use coupon code. Get 5% off any order $79+ using the coupon code online at Classic Hostess. Click link to save. Click the link to shop at Classic Hostess today and save 5% on all orders of new Spring Items when you enter our coupon code at checkout. Use this exclusive RetailSteal coupon code at Classic Hostess and enjoy a $10 discount on your order of $75+. Shop at Classic Hostess and save $5 off with purchase of $30 and above. Save up to 50% on the latest special offers happening now at Classic Hostess. Click to shop and save. 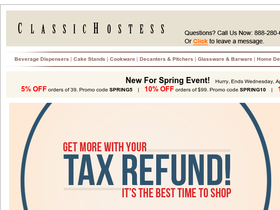 Use this limited time coupon code at ClassicHostess.com and enjoy free shipping on your purchase over $39. Click here to shop. Save $15 on purchases of $139 or more at Classic Hostess she you use our coupon code online today. Click link to shop. Shop at Classic Hostess online this Veteran's Day to save 10-15% on purchases. Click link to shop.